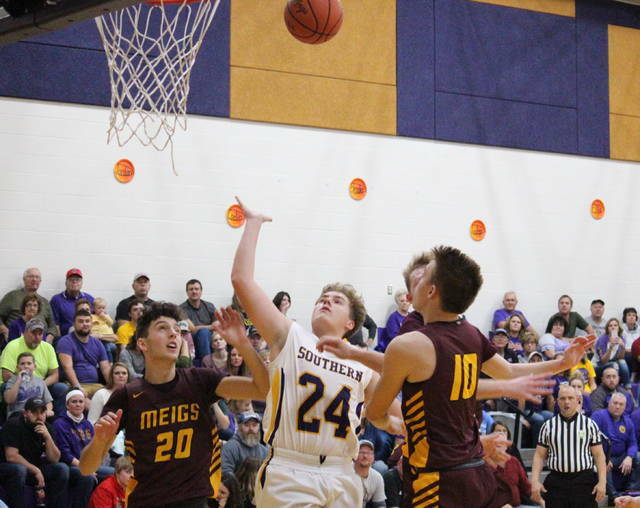 Meigs junior Bobby Musser attempts a high-post shot in between Tornadoes Weston Thorla (4) and Jensen Anderson (24), during the Marauders’ 60-43 victory on Friday in Racine, Ohio. RACINE, Ohio — A game-clinching run doesn’t always happen at the end. 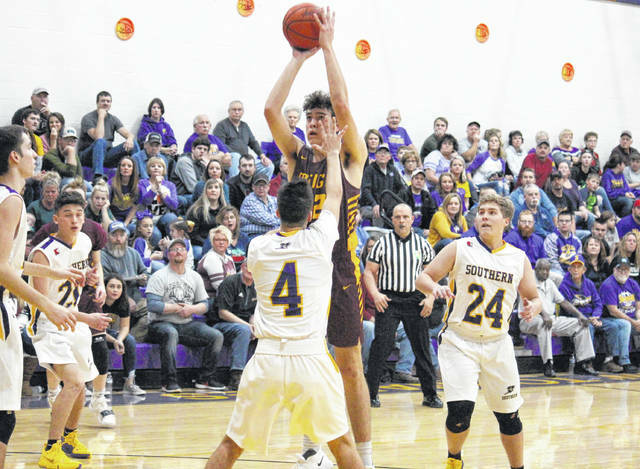 The Meigs boys basketball team held non-conference host Southern scoreless for over six minutes in the middle of Friday’s season-opener in Meigs County, as the Marauders turned a three-point deficit into a double-digit lead and never looked back on their way to the 60-43 victory. After a pair of early lead changes, Southern (0-1) built its largest lead of the night, at 12-5, with 3:30 left in the opening quarter. Meigs (1-0) trimmed its deficit to two points, at 14-12, by the end of the quarter. 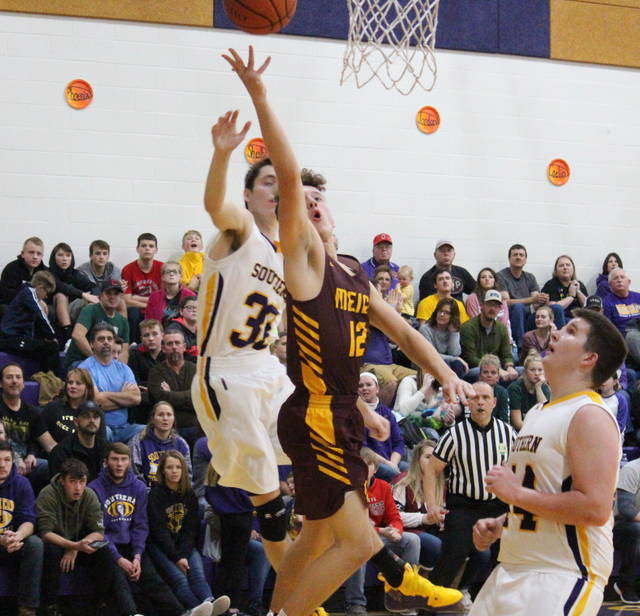 The Tornadoes outscored Meigs 7-to-6 over the first three minutes of the second quarter, but the Marauders tallied 11 consecutive points to take a 29-21 lead into the half. 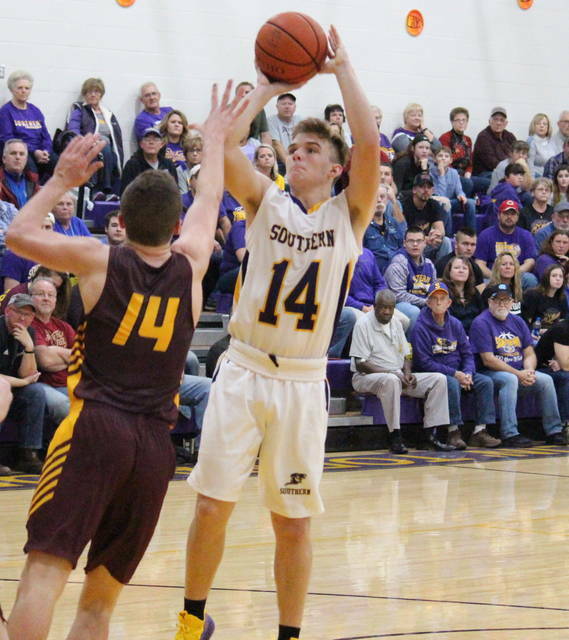 The Maroon and Gold hit back-to-back buckets in the opening minute of the second half, before Southern snapped its cold spell with a two-pointer of its own. The Marauder lead grew to as high as 19 points, at 44-25, with two minutes left in the third. However, the Tornadoes ended the period with an 11-2 run, trimming their deficit to 10 points, at 46-36. Meigs began the fourth quarter with a 6-to-3 run in the first 3:30, and then both teams tallied four points in the following minute. The Marauder defense locked down the 60-43 victory by holding Southern scoreless for the final 3:30 of regulation. The triumph is win No. 1 in the Maroon and Gold for first-year Marauders head coach Jeremy Hill, who was delighted with how his team performed in their season-debut. “Anytime you get a win it feels great, but I really feel good for the kids,” Hill said. “They’re just phenomenal, they have a lot of talent and a lot of athleticism. They work hard, they play hard, they’re extremely respectful and they’re more coachable than you could ever imagine. Conversely, 11th-year Tornadoes head coach Jeff Caldwell acknowledged the areas that gave the Marauders an edge, and identified areas his team must improve on. “They cranked up their defense and we didn’t respond to it very well,” Caldwell said. “They hurt us on the boards all night, and our defense was not good, so we have to get better defensively and we have to rebound. We also need to be able to handle the pressure. For the game, Meigs shot 24-of-58 (41.4 percent) from the field, including 3-of-11 (27.3 percent) from three-point range, while Southern shot 15-of-50 (30 percent) from the floor, with a 7-of-24 (29.2 percent) three-point mark. At the free throw line, MHS was 9-of-14 (64.3 percent), while SHS was 6-of-11 (54.5 percent). The Maroon and Gold claimed a 42-to-23 advantage in rebounding, including 14-to-7 on the offensive glass. The Marauders totalled 13 assists, 11 steals, 16 turnovers and one rejection, while the Tornadoes combined for nine assists, seven steals, 18 turnovers and one blocked shot. MHS junior Weston Baer made eight field goals, including one three-pointer, on his way to a game-best 20 points. Zach Bartrum made a team-best two triples, and finished with 17 points, while Nick Lilly came in with nine points and a game-high 12 rebounds. Wyatt Hoover scored six points for the victors, while Ty Bartrum, Coulter Cleland, Cooper Darst and Bobby Musser tallied two points apiece. Darst and Zach Bartrum led the Marauders with four assists apiece, with Darst also recording the team’s lone rejection. Cleland, Ty Bartrum and Zach Bartrum marked two steals apiece for the MHS defense. Jensen Anderson knocked down a trio of three-pointers and led the hosts with 14 points. Cole Steele also hit three shots from deep on his way to nine points, while Trey McNickle chipped in with eight points. Austin Baker had six points in the setback, Brayden Cunningham contributed five points and a team-best eight rebounds, while Weston Thorla was held to one marker. Thorla and McNickle each had three assists to pace the Purple and Gold, with McNickle also leading the team’s defensive effort, recording three steals and a rejection. Both teams continue non-league action on Tuesday, with the Marauders welcoming Warren, and Southern hosting Nelsonville-York.